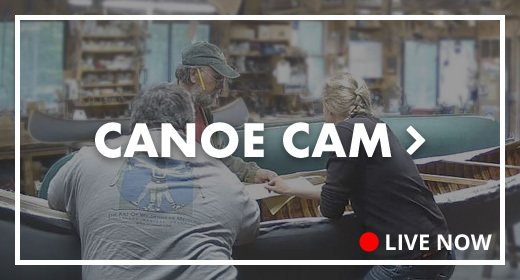 Plans & Kits - Northwoods Canoe Co.
Northwoods Canoe Company offers four different canoe designs for the amateur builder; the 17½-foot Atkinson Traveler, the 15-foot Cheemaun, the 10-foot Whisper and the historic 17-foot B.N. Morris. These construction plans come with full-size paper patterns that eliminate the complicated steps of lofting and mold pattern development. Working carefully from these plans, many amateur builders have built very accurate canoe forms for building their own canoes. Detailed instructions for building this type of form are given in the book, The Wood and Canvas Canoe. The B.N. Morris plans offer three different styles of construction in one set of plans. 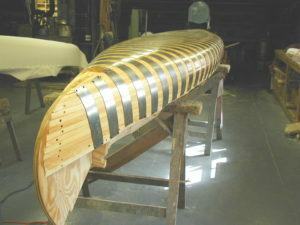 Construct this canoe as (1) a Wood Canvas model, (2) an all-wood Rushton-style canoe, or (3) a modern wood strip and fiberglass canoe. ALL PLANS ARE FOR AMATEUR USE ONLY. Any use of these plans to construct boats intended to be sold is strictly prohibited. This package contains all the stations, pre-cut in ​¾” plywood, pre-marked, beveled and ready to be attached to the mold backer. Construction plans and materials list are included. The plywood stations are shipped in one box via UPS. Cost will vary depending upon the canoe model and shipping location. This kit includes all materials to build a form. Included are construction plans, materials list, pre-cut stations, mold backer marked to receive the stations, pre-milled ​¾” rib-band stock, metal clinching bands, wood fillers, nails, screws and other miscellaneous supplies required to complete a solid form. The form kit will be shipped in two packages. Most of the materials for the form are shipped in one long wooden box by common carrier. Shipping cost will vary, but could be between $150 and $250. The plywood stations are sent in one box by UPS. This kit contains all the pre-cut materials required to build the canoe. Included are pre-cut and shaped white cedar ribs, half ribs and planking, spruce rails beveled and rabbeted as needed, pre-bent stems, pre-finished caned seats, a clinching iron, brass tacks, bronze bolts and stem bands, canvas, canvas filler, varnish and your choice of marine finish paint. The shipping for canoe kit materials consists of three different packages. One long wooden box fits most of the wood, canvas, and hardware. This box must be sent by common carrier and may cost between $150 and $250. The pre-bent stems are in a second box and the filler and paints in a third. These two smaller boxes can be sent via UPS. There is much more to the design of an efficient paddle than would appear at first glance. These plans give you all that information plus a seven-page instructional brochure to guide you through each step of the paddle’s construction. They include full-sized patterns for both bow and stern paddles. Although the North Woods Paddle is an efficient paddle for almost any stroke, it is specifically designed for the North Woods Stroke. We urge paddling enthusiasts to explore this technique. 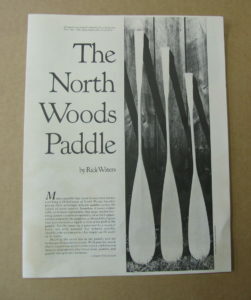 In this brochure, Alexandra Conover guides you through each step in carving a North Woods Paddle, using only sharp hand tools, without the need for expensive power tools. You will find detailed photos of design features, a brief history of the paddle, and scaled-down plans. This brochure, which comes with the Paddle Plans (see above), is also available separately.